Google seems to be pretty serious about their little PayPal killer, and is releasing a steady stream of new features that appear to be addressing merchant needs. This is a product that we’ve been using steadily since launch to bill event sponsors. It’s had some hiccups, particuarly around some overly aggressive fraud controls that cancelled a bunch of transactions, but overall we’ve been pleased with the product, and it presents a less intrusive checkout experience for the person paying than PayPal (which we use for our CrunchBoard job board). The two most recent new features – a coupon creator and an email invoice product – are almost certainly the result of customer feedback. We tested the email invoice product this evening – it allows a quick invoice for any amount to be sent out to an email address. The payor does not need to have a Gmail account to pay the invoice. It also allows for quick, one time charges to customers. Previously, checkout buttons had to be created for set amounts which made it easy to charge the same price over and over to multiple buyers, but difficult to use for one-off charges. This solves that issue. Google is also waiving all transaction fees (2.0% plus $.20 per transaction) through the end of the year in a marketing move to get new merchants for the holiday season. We have first hand and ongoing experience dealing with both PayPal and Google Checkout. When we’ve had to contact Google about issues (such as the suspected fraud), we’ve received intelligent customer service and the problems were quickly resolved. Contacting PayPal customer support, on the other hand, has been a complete nightmare. Automated response hell, followed by canned responses that didn’t address our issue, followed by silence. 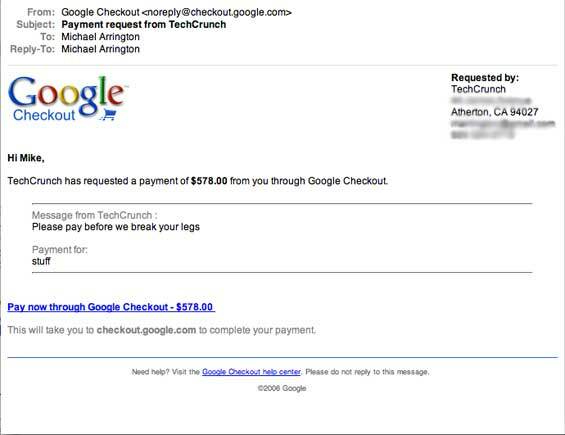 If you are a merchant shipping physical goods and don’t want to deal with the hassle of setting up a merchant account and integrating checkout software, Google Checkout is a very good product, and certainly better than what PayPal offers. Google’s fees are also significantly lower than PayPal’s (and they also refund most of the fee when returns are processed, whereas PayPal charges their processing fee twice).